INDICATIONS :Wearing EPITHELIUMFLEX® 03 knee pads helps stabilize the knee joints during repeated bending and stretching during sports. They help to relieve patellar pathologies (patella syndrome, patellar instability, patellar tendinopathy, etc.) or residual pain from previous trauma (sprain, ligament or meniscus injury, etc.). 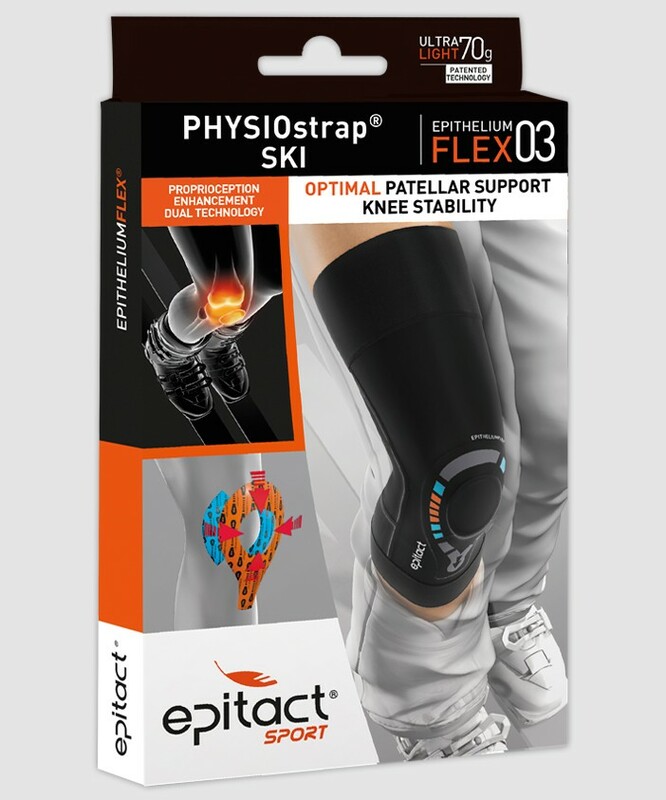 - REINFORCED SUPPORT ACTION : Wearing the EPITHELIUMFLEX® 03 Knee Support contributes to stabilising the knee joint for repeated flexion-extension movements during participation in sports.It helps relieve patella (kneecap) disorders (patella syndrome, patellar instability, patellar tendinitis, etc.) or pain generated by sequelae from a previous injury (sprains, ligament injury, meniscus, etc.). - STABILISING ACTION : EPITHELIUMFLEX® combines a patented silicone double tendon support with high performance REFLEX compression fabric to improve kneecap support and knee stability. SPECIFICITY : The knee support acts dynamically without impeding movement. 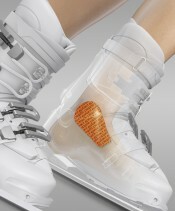 Therefore, it can be used in prevention, because it preserves the muscle mass. ERGONOMICS : This concentrated technology in less than 70 g was specifically designed for sports (skiing, snowboarding, etc.). It does not slip and does not cause any discomfort behind the knee (popliteal fossa). Being extra thin, it can be worn under all types of clothing, even under technical undergarments (non-compression). CONTRAINDICATIONS : Wearing the EPITHELIUMFLEX® 03 knee brace helps stabilise the knee joint during board sports which involve repeated flexion and extension movements. It relieves kneecap disorders (patellofemoral pain syndrome, patellar instability, patellar tendinitis etc. ), or pain resulting from the residual effects of previous injuries (sprain, ligament or meniscus lesion etc.). 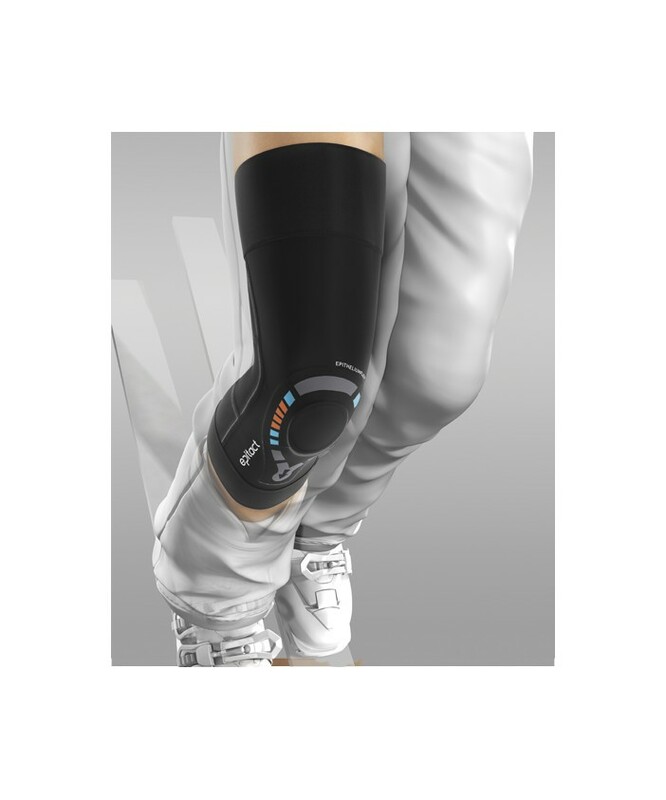 To avoid any irritation caused by the silicone elastic bands, the knee brace should not be worn in a static position, particularly with the wearer lying down (sleep) or sitting (e.g. during bus or car journeys, lunch breaks etc.). 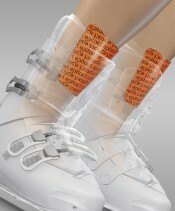 This knee brace should be put on right before starting board sports activities and worn only during exercise. The materials used have passed all the regulatory tests required by ISO standard 10993-1 relating to products that come into contact with the skin. However, if an incident occurs, stop using the product immediately and inform MILLET Innovation. If you experience pain, oedema, discomfort or any other abnormal reaction, stop using the product and consult a doctor. HOW TO FIT THE KNEE BRACE. 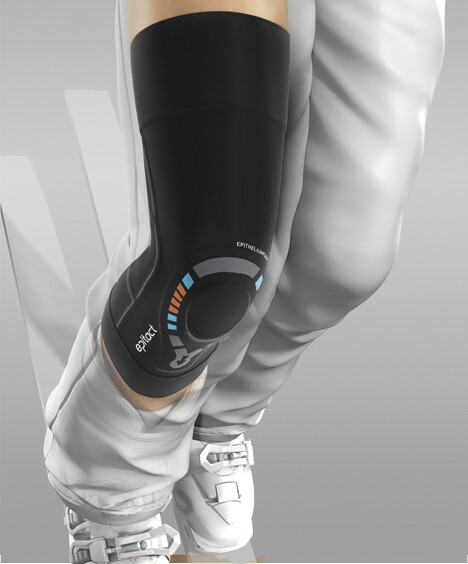 B) Fold the knee brace back on itself to slip it on and position the kneecap in the centre of the “support ring“. C) Unfold the elastic bands without stretching your leg. D) Adjust your knee brace in the standing position and ensure that the support rings are in a flat position. HOLD: Do not apply moisturising products to the skin before using the knee brace to ensure optimum hold. IMPORTANT ! Place the knee brace on the thigh without stretching it. To guarantee good hold, the product must be washed after each use. At the very least, wash the silicone elastic bands with soap and water (without scrubbing them) to remove any dirt. WASHING INSTRUCTIONS : Machine wash at 40°C or hand wash (without scrubbing), leave it to dry naturally. Do not iron. ERGONOMIC DESIGN : The EPITHELIUMFLEX® 03 knee brace is a concentrated technology weighing less than 70g, which has been specifically designed for board sports (skiing, snowboarding etc.) Its patented silicone patellar support ring, combined with REFLEX ultra-effective compression fabric, provides optimal kneecap support and knee stability. EPITHELIUMFLEX® 03 knee brace is designed to fit either the right or the left knee. It does not slip and does not cause any discomfort at the back of the knee (popliteal fossa). 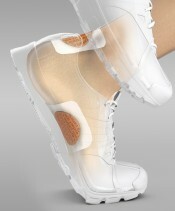 Extra-thin, it can be worn under all types of clothing, even technical clothing (non-compressive). COMPOSITION : 70 % tissu polyamide/elastane fabric, 30 % silicone. MILLET Innovation cannot be held liable in cases where the manufacturerʼs recommendations have not been followed during use. French is the reference language. CE initial marking: 2016.